The Urbanist, a site devoted to urban policy and quality of life, has named the intersection of North 50th Street and Stone Way North the worst in Seattle. This five-way intersection features a confusing array of crosswalks, bike lanes, and turn lanes; motorists have reported waiting through multiple light cycles just to get through the intersection, and pedestrians have to wait several minutes to cross the street. Bikers are forced onto tiny bike lanes with insufficient distance from passing cars and no connection to the lanes at Stone Way and Green Lake Park. The intersection itself is surrounded by pedestrian-unfriendly areas without sidewalks or paved paths; walkers, joggers, and bikers must all share a narrow unpaved walkway. What made this particular spot so dangerous? According to researchers, it was originally planned as an ordinary four-way intersection. Traffic engineers building the Pacific Highway in the 1930s ignored the existing street grid, choosing instead to build a road that would provide the quickest possible route to downtown. That road, Green Lake Way North, cut an irregular slice out of the square lots in the area. The result? Irregularly-sized triangular lots and a “convenient” route that’s anything but convenient for motorists. Seattleites have several proposals for fixing this traffic mess. The first is “rolling back” the intersection to its original function, removing the awkwardly placed diagonal road so traffic can flow more smoothly. Another suggested a roundabout, which would decrease the speed of individual cars but increase the overall traffic flow. Seattle’s ever-expanding population is posing a unique challenge to urban planners already scrambling to fix an outdated, and often nonsensical, street grid. As more residents leave cars behind in favor of walking, biking, and public transit, officials are struggling to create the necessary infrastructure to keep them safe. Bikers recently protested the city’s latest bike plan, which cut 11 miles of previously planned protected bike lanes and reduced plans for greenways by 20 miles. Some particularly ambitious city planners are beginning to talk about putting a lid over I-5, which cut many walkable neighborhoods off from downtown when it was built in the 1950s. And the city has plans to spend $651,000 on high-tech traffic lights that can ease congestion by changing light cycles in response to traffic backups. Seattle is one of the fastest-growing cities in America, and boasts one of the country’s hottest job markets. It also has some of the most uniquely challenging geography in the world, with traffic flow restricted across the urban core by waterways that force cars onto bridges. Its laws governing density are also some of the strangest in the nation, with developers protesting regulations that make condominiums prohibitively risky to build and restricting high-density living arrangements to widely spaced “urban village” areas designated decades prior to today’s population explosion. 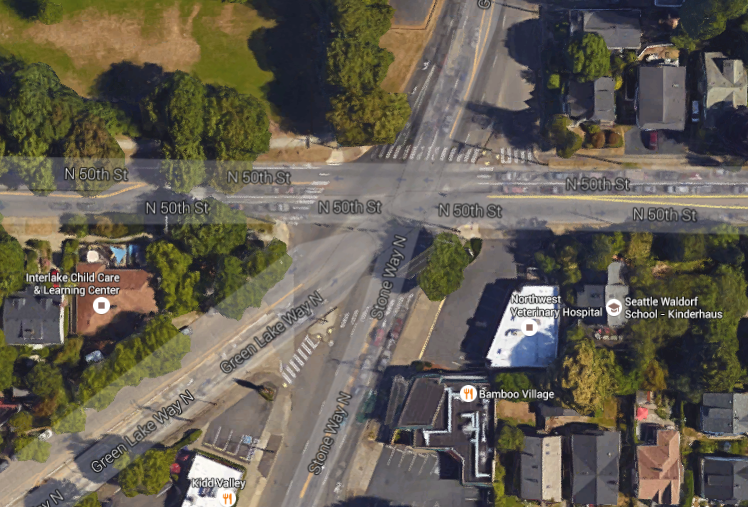 Despite Mayor Murray’s ambitious Vision Zero plan for Seattle’s traffic safety, many dangerous intersections in the city have no immediate plans for improvement. If you've been involved in a pedestrian accident, contact Davis Law Group.